Burgeoning Wolverine Star: Unsound defense or blown coverage? This defense is unsound. Does Mattison want it to be unsound because it makes Kovacs pop up for turnovers or does he have little choice in the matter because he's starting a walk-on (Heininger—Kovacs has graduated), a couple freshmen, and only 2.5 non-walkon seniors (RVB, Martin—Woolfolk is the half)? I don't know, but I'm betting it's the latter. I am glad they've got a week to practice not leaving guys wide open all day. They're busting coverages every other play. While I agree with him on the former--Kelly clearly studied Michigan's defensive tendencies against Western Michigan and instructed his QBs to use a hard count--I think Brian is wrong in calling this defense unsound, mostly because the result of this play was because of a blown coverage rather than a poor defensive playcall. The play in question is a zone blitz in which Michigan's weakside linebacker (Desmond Morgan) blitzes off the edge as Ryan Van Bergen drops into zone coverage on the other side of the field. Michigan is in a basic cover-3 look with Kovacs, Marvin Robinson, and JT Floyd playing deep thirds. Underneath, Michigan is supposed to be playing quarters zone coverage with Thomas Gordon, Van Bergen, Kenny Demens, and Courtney Avery covering the field. Unfortunately, Demens completely forgets his coverage, opening up an easy slant route for Tommy Rees. Here you can see Demens and Van Bergen essentially stacked on top of one another. Michigan is playing a cover-3 zone over the top, meaning Floyd (off screen), Robinson (off screen), and Kovacs are covering any vertical routes up the field. As such, there's no reason that Demens and Van Bergen should be stacked like this. In addition, you can see both players looking to exactly the same spot, which either means one player is looking the wrong way, or Mattison has called for man coverage from this look and is asking Van Bergen to drop into man coverage from a three-point stance and guard a wide receiver. To Tommy Rees' right are two receivers running quick slants into a completely vacated zone. Avery came in for some criticism on MGoBlog for not jamming Floyd here and staying with his man when in reality, Rees throws the ball directly through the zone that Demens should be covering. Although the Cardinals used an aggressive tactic in the cornerback blitz, they were not actually playing an aggressive defense; a common bait-and-switch in the NFL, particularly against young quarterbacks. 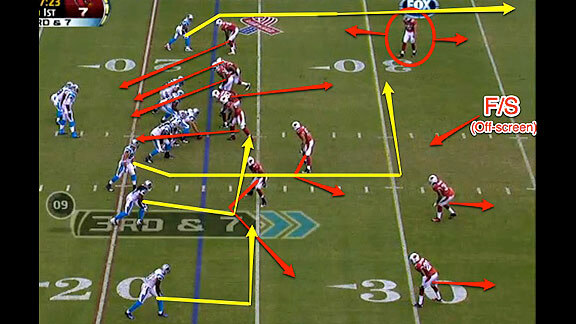 Instead, the corner blitz was part of a zone blitz scheme: the blitzing cornerback was one of only four defensive players rushing (and the Panthers did an excellent job in picking up these rushers, particularly RB Jonathan Stewart), while the other seven pass defenders played zone. While obviously not identical to the blitz that Michigan called, the principles are the same. 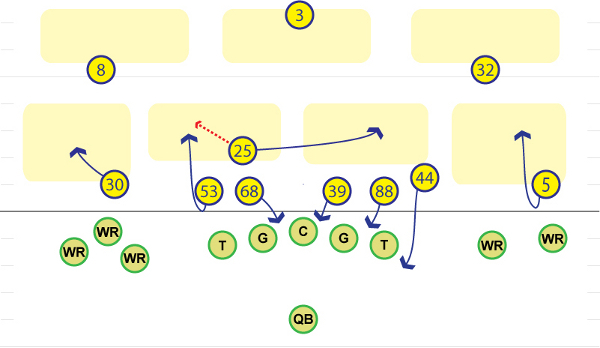 Michigan was showing an aggressive blitz but dropping players into the underneath zones to confuse Rees. 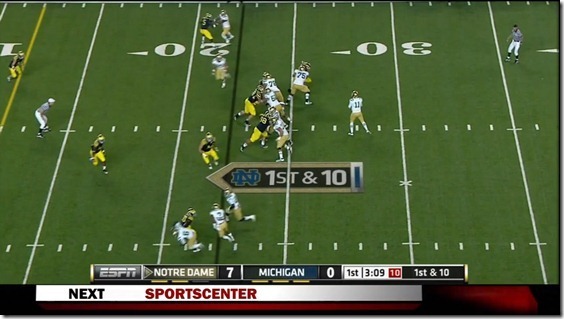 Notre Dame's play was successful because Demens got crossed up in coverage and completely disregarded his zone. The good news is that Mattison isn't an idiot. Were the play actually designed as it was executed, it would be a completely incoherent defense. Michigan would be stacking zone receivers and vacating large sections of the field. In my opinion, the NFL blitzing genius who captained one of the best NFL defenses of the last five years is not wont to make calls this egregiously bad. The bad news is that there are still growing pains with this defense, but that's to be expected. Demens had a few blown coverages last year that he quickly learned from and corrected. Having only two games under this new system, these sorts of mental errors are to be expected. And with two games against cupcake(-ish) opponents approaching, this will be a chance for the defense to solidify these types of playcalls and avoid blown coverages like the one above when Big Ten play begins.